Listed below are the best and most popular hill stations near Mumbai. Most hill stations around Mumbai are in Maharashtra’s “Sahyadri” mountain range, also known as the “Western Ghats”. The “Western Ghats” is an UNESCO World Heritage Site and is home to over 139 mammal species, 508 birds, 179 amphibians, 288 freshwater fish species and 7,400 flowering plants species. Because of its rich biodiversity, the “Western Ghat” is one of only twenty five biodiversity hotspots in the world. The only other biodiversity hotspot in India is in the North East along the Indo-Myanmar border. Location: 110 Km from Mumbai and 120 Km from Pune. Height: 800 meters (2,600 feet) over sea level. Attraction: Scenic Beauty, Horse Riding, Nature Walks, Pleasant Weather. The many attractions of Matheran Hill Station include the wonderful views, proximity to Mumbai and Pune, toy train ride from Neral to Matheran, clean air (vehicles are banned in Matheran) and horse riding. Matheran has 38 look-out points which provide amazing views of the surrounding area. Matheran also has 2 lakes which add to its charm. The 20 Km narrow gauge toy train from Neral to Matheran is a tourist delight. The Matheran train started operation in 1907. Matheran is the only hill station in Asia where vehicles are not allowed; so to go from one place to another, there is a lot of walking or horse riding involved. Neral on the Mumbai CST to Karjat route is the closet Central Railway station to Matheran. There are regular train services from Mumbai to Neral. Private cars can be parked at the outskirts of Matheran. Location: 270 Km from Mumbai (via Expressway), 226 Km via Mumbai-Kolad- Mahad, and 120 Km from Pune. Height: 1372 meters (4,500 feet) above sea level. Attraction: Scenic Beauty, Nature Walks, Pleasant Weather, Boating, Waterfalls. Mahabaleshwar is located in the Sahyadhri mountain range and it is one of Maharashtra’s largest hill station. Visitors come to Mahabaleshwar to spend time in the hills, to enjoy its scenic beauty and for its lovely weather. 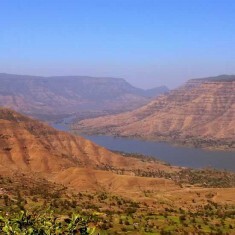 There are many scenic “Points” around Mahabaleshwar that have stunning views of hills, forests and valleys; of these the most famous points are Lodwick Point, Arthur’s Seat, Tiger’s Spring, Elephant Point – aka Needle Hole Point, Bombay Point, Wilson Point, Kate’s Point, 3 Monkey Point, etc. Visitors to Mahabaleshwar can enjoy boating at Venna Lake. 24 Km from Mahabaleshwar is one of Maharashtra’s best fort – “Pratapgad Fort”. Built by Shivaji, it was here that he killed Afzal Khan. India’s third longest river, “Krishna River”, starts from the Mahadev Temple in Old Mahabaleshwar. Mahabaleshwar’s Panchganga Mandir is said to contain water of five rivers – Krishna, Koyna, Savitri, Venna, and Gayatri. 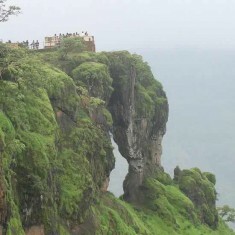 Mahabaleshwar is especially beautiful during the rainy season, when everything is green and there are many waterfalls. 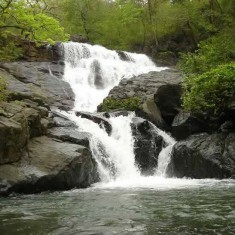 Lingmala Waterfall is a spectacular waterfall that comes alive during the rains. Panchgani Hill Station is 19 Km East of Mahabaleshwar. Expect large crowds, and the accompanying traffic jams during long weekends and holidays. Please visit this article for road route and travel map from Mumbai to Mahabaleshwar. Location: 250 Km from Mumbai (via Expressway), 245 Km via Mumbai-Mahad-Mahabaleshwar, and 100 Km from Pune. Height: 1334 meters (4,375 feet) above sea level. Attraction: Scenic Beauty, Table Top Hill, Nature Walks, Pleasant Weather. Panchgani means “Panch” (5) “Gani” (Hills). The main tourist attraction of Panchgani is “TableLand”, which is a flat hill top, which offers stunning views of hills and the Krishna River valley. Panchgani’s other main scenic places are Sydney Point, Parsi Point, Devil’s Kitchen and Mapro Garden. Panchgani is well known for its famous boarding schools; Freddie Mercury, the vocalist of the rock group Queen was an alumnus from Panchgani’s Saint Peter’s Boarding School. Old British era houses add to the old world charm of Panchgani. Both Panchgani and nearby Mahabaleshwar are famous for their strawberries and raspberries. “On Wheelz” in Panchgani is an amusement park for both kids and adults. Panchgani’s “Velocity Entertainmentz” has Go-Karting, rides and indoor games. Please visit this article for road route and travel map from Mumbai to Panchgani. Location: 185 Km from Mumbai and 55 Km from Pune. Height: 640 meters (2100 feet) above sea. Attraction: Scenic Beauty, Pleasant Weather, Adventure and Water Sports. Lavasa is India’s newest city and hill station, which is located on the banks of Dasve Lake in the eco sensitive Western Ghats. Tourist attractions at Lavasa include spending time in the hills, nature walks, adventure sports, water sports on the lake, games arcade and indoor golf. 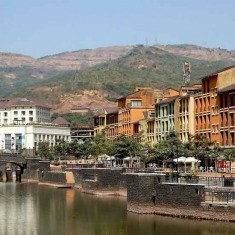 In design and style, Lavasa is based on the Italian city of Portofino. Lavasa is planned as a collection of 5 towns built on 7 hills; currently construction is going on in 2 towns – “Dasve” and “Mugaon”. Lavasa has hotels, educational institutions, apartments, villas, water sport facilities, etc. Location: 135 Km from Mumbai and 120 Km from Pune. Height: 670 meters (2,200 feet) above sea level. Attraction: Waterfalls (during monsoon), Scenic Beauty, Flamingoes and Migratory Birds, Forts, Trekking. Malshej Ghat is a mountain pass that is located where the plains suddenly rise up and form the elevated Deccan plateau. The hills and valley views from Malshej Ghat are majestic. 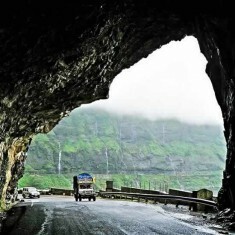 The best time to visit Malshej Ghat is during the rains. There are waterfalls everywhere and the sight is simply amazing. 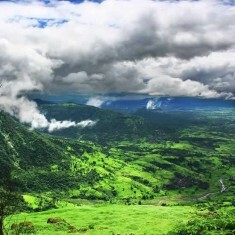 During the Monsoon season Malshej Ghat is among the favourite day trip picnic locations for people from Mumbai and Pune. Just south-east of Malshej Ghat is Pimpalgaon Joga Dam, where flamingoes and other migratory birds visit from November to February. The historical hill fort of Harishchandragad is located a short distance from Malshej Ghat. Shivneri Fort, the birthplace of Chatrapati Shivaji, is 30 Km from Malshej Ghat. 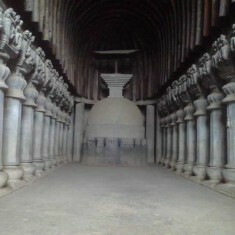 4 Kms from Shivneri is Lenyadri, which has 30 Hinayana Buddhist caves. Word of caution – during the rains there is heavy mist at Malshej Ghat, the roads get slippery, there are landslides and people come onto the roads to bath under waterfalls. Location: 130 Km from Mumbai, 200 Km from Pune, 45 Km from Nashik. Attraction: Scenic Beauty, Vipassana Center, Nature Walks, Trekking, Pleasant Weather, Waterfalls, Forts. Igatpuri is a hill station on the busy Mumbai-Agra National Highway (NH) 3. 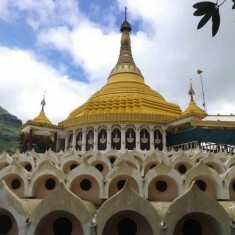 Vipassana International Academy, the world’s largest Vipassana meditation center, is located at Dhamma Giri, near Igatpuri. This meditation center has a lovely golden pagoda and it offers free Vipassana meditation courses. The best time to visit Igatpuri is during the Monsoon season because the whole place becomes bright green and visitors can enjoy the many waterfalls in this area. Places to see in and around Igatpuri are Valleys (Bhatsa River Valley, Camel Valley, Konkankada Valley), Waterfalls (Five Igatpuri Waterfalls near Ghatandevi Temple, Randha Falls, Umbrella Falls), Lakes (Bhatsa Lake Valley, Upper Vaitarna, Mukane Reservoir, Tansa Lake, Lake Beale, Kadwa Reservoir, Bhawala, Tringalwadi Dam, Wilson Dam, Arthur Lake, Talegaon Lake), Rivers (Godavari River, Darna River), Forts (Tringalwadi Fort, Ratangadh Fort), Temples (Ghantadevi Mandir, Trimbakeshwar Temple that as one of only twelve Jyotirlingas, Amruteshwar Temple), Nature Reserve (Kalsubai Nature Reserve), Mountain Climbing (Kalsubai Peak – the highest mountain in the Sahyadri range in Maharashtra), Bhandardhra Hill Station, Sula Vineyard, Kasara Ghat. Note of caution – Igatpuri experiences heavy mist, which makes driving dangerous. Location: 95 Km from Mumbai and 65 Km from Pune. Height: 624 meters (2,047 feet) above sea level. Attraction: Scenic Beauty, Buddhist Caves, Nature Walks, Trekking, Pleasant Weather, Waterfalls, Forts. Lonavla and Khandala are two hill stations which have become popular because of their p[proximity to Mumbai and Pune. As with most hill stations in Maharashtra, the best time to visit Lonavala and Khandala is during the Monsoon when there are numerous waterfalls and greenery everywhere. Main tourist attractions in and around Lonavla and Khandala are its scenic viewing points (Rajmachi Point, Tiger’s Point, Lion Point, Monkey Point, Sunset Point, Duke’s Nose/Naagphani, Shooting Point), Buddhist Caves (Karla Caves, Bhaja Caves, Bedse Caves, Tikona Fort), Waterfalls (Kune Falls, Bhushi Dam, Kataldhar Waterfall), Gardens (Ryewood Park, Shivaji Udyan, Valvan Dam Garden), Lakes and Dams (Tungarli Lake, Valvan Dam), Forts (Lohagad Fort, Visapur Fort, Korigad Fort, Tikona Fort, Tunga Fort, Rajmachi Fort) and Amby Valley City. Location: 165 Km from Mumbai and Pune, and 75 Km from Nashik. Height: 915 meters (3,000 feet) above sea level. Attraction: Scenic Beauty, Dam, Nature Walks, Trekking, Pleasant Weather, Waterfalls. The central attraction of Bhandardara is Arthur Lake (Bhandardara Lake) and Wilson Dam; both of which are on the Pravara River. When water is released from the dam, it forms an Umbrella shaped waterfall and it is popularly known as the “Umbrella Falls”. Randha Falls is a popular tourist place near Bhandardara. It is located 11 Kms from Bhandardara and offers beautiful views. Maharashtra’s highest mountain peak is Mount Kalsubai (5,400 feet) and it is visible from Bhandardara. Climbers start the trek to Mt Kalsubhai from Bari Village which is 12 Kms from Bhandardara. The trek to Ratangad Fort is popular among visitors to Bhandardara. The beautiful Amruteshwar temple is 22 Kms from Bhandardara. The hill station of Igatpuri is only 45 Kms from Bhandardara. Igatpuri has many tourist places and things to do (please read the section on Igatpuri). The MTDC resort is located on Arthur lake; during the Monsoon it tends to be full so advance booking is recommended. Location: 160 Km from Mumbai, 260 Km from Pune, 80 Km from Nasik. Height: 447 meter (1,470 feet) above sea level. Attraction: Scenic Beauty, Nature Walks, Pleasant Weather, Waterfalls, Royal Palace. Jawhar is a quaint little hill station that has not yet been fully commercialized. The road leading to Jawhar and Dabhosa Falls passes through ghats and around small lakes. 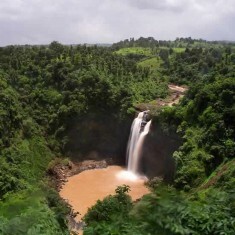 Dabhosa (Dadar Kopara) Waterfall is a perennial fall located 16 Km from Jawhar. Falling from a height of 300 feet Dabhosa is one of the tallest waterfalls in Maharashtra. Other waterfalls around Jawhar are the 100 feet Kalmandavi Waterfall (perennial fall), Palusa Falls and Hiradpada Waterfall. Jawhar is well known for “Warli” artwork, which is done by the large tribal community in and around Jawhar. Jai Vilas Palace (Raj Bari) is a must see place in Jawhar. This pink stone palace was home to the Mukne royals, who were rulers of the princely state of Jawhar. Jawhar has two scenic viewing points – Hanuman Point (Sunrise Point) and Sunset Point, which have beautiful views of the valleys below. 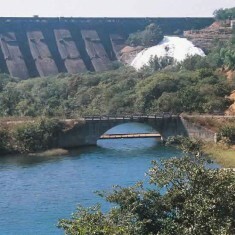 Jai Sagar Dam and Lake is a tourist attraction in Jawhar. Location: 375 Km from Mumbai, 230 Km from Pune, 20 Km from Kolhapur. Height: 754 meter (2,474 feet) above sea level. Attraction: Panhala Fort, Scenic Beauty, Nature Walks, Historical Significance. 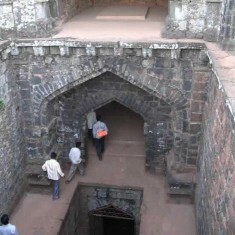 The city of Panhala is built in the historic Panhala Fort. Built between 1178 and 1209 by Raja Bhoj II, Panhala Fort is the largest fort in the Deccan region. Panhala Fort was the Capital of the Maratha State until 1782. Interesting places to visit in Panhala include Ambarkhana (fort’s granary), Ambabai Temple, Teen Darwaja, Sajja Kothi, Sambhaji Temple, Someshwar Tank, Andhar Bav and Nayakini Sajja. A local guide will usually take visitors to 15 points. Located 20 Km Northwest of Kolhapur, Panhala Fort was an important outpost along a key route through the Western Ghats (Sahyadri). The road up the hill to Panhala is scenic, with lovely views of hills. Note of Caution – During holidays, visitors may have to park their vehicle before the city because of heavy rush and limited parking in Panhala. Pictures of Western Ghat Hill Stations in the Rain.